December 22, 2015 – Susan F.
Cancer Survivorship: What About the Chemo Wig? As an animal lover and psychotherapist, I've seen the healing power of pet therapy firsthand. From horses to dogs, cats and rabbits, the impact that animals have on recovery is nothing short of miraculous. 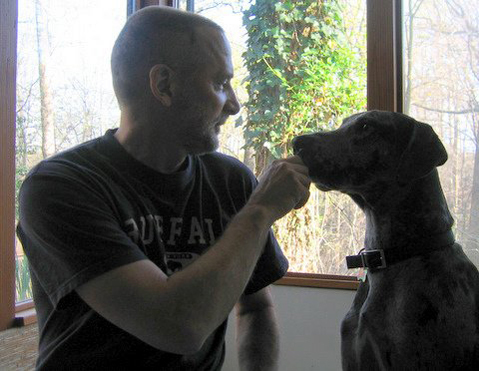 On the day that I bit the bullet and shaved off the hair that was quickly abandoning my scalp due to chemotherapy, I had my picture taken with our Great Dane, Daphne. I did this because I always feel better around our pets, no matter what's happening. Additionally, I knew that I would be sending the picture to friends and family and her presence would soften the shock of my new look. As an animal lover and psychotherapist, I’ve seen the healing power of pet therapy firsthand. From horses to dogs, cats and rabbits, the impact that animals have on recovery is nothing short of miraculous. Therefore, I think that everyone who receives a diagnosis of cancer should also receive a puppy (or other small animal of their liking) right after they're advised about the possible side effects that can come with chemotherapy. All of these great benefits and the only side effect is occasionally being slobbered on. To anyone who is already a pet owner, it's old news that pets help keep us healthy and sane. Those of us who’ve routinely shared our homes with pets don’t need scientific data to prove that the animals we invite into our lives occupy a special place in our hearts. Aside from the Internet sensation of cat and kitten videos, pets provide much more than just entertainment. From companionship to unqualified acceptance, pets should be on the top of anyone’s wellness checklist. I've heard from numerous clients experiencing physical and/or mental distress that their pets were keeping them grounded. Personally, my daily walks with our dogs were an important ritual that provided a sense of normalcy to days where nothing made sense. I knew that when I came home, under the heavy burden of thinking, "I can't do this anymore," our Brittany, Sage, would meet me at the door, favorite squeaky toy in her mouth, with a look that said, "Yes you can, now let's play fetch." One of the more powerful (yet overlooked) aspects of having pets around during recovery is that they allow those of us who are in the care-receiving category to reach out and care for something beyond ourselves. This extension of loving energy has a rebound effect as we gain the awareness that, in spite of our illness, we have much to offer. I found that our cats' purrs of appreciation would drown out the echoes of the radiation machine like a meditative mantra easing me toward peaceful rest. Naysayers would suggest that we animal lovers simply project human qualities onto our pets. To them I say, "Try telling that to my 110-pound Great Dane and she’ll bite your knees off!" (Actually, like her dad, she’s more of a pacifist and prefers napping over nipping). What connects us to our furry friends is not that we project human qualities onto them; they bring out the true humanity in us. In addition, without the human ego, animals are more connected to the source of life and therefore offer a portal to the present moment. In the wonderful book "Guardians of Being," Eckhart Tolle writes, "It's so wonderful to watch an animal, because it has no opinion about itself." Rather than make them more like us, we would all do better with a more dog-like philosophy of "sit, stay and heel” as an antidote to all of our frantic wanderings. I still remember with fondness an in-home counseling session I had years ago with an elderly gentleman who had recently lost his wife. He had been struggling with depression since that time and found it hard to look after his health. While he talked with me, his golden retriever sat quietly at his feet. With both sadness and gratitude, he pointed out that they had brought the dog home while his wife was still ill. Looking back at it, he said he realized that she’d done it for him, so that he would not be alone when she was gone. Understanding the profound comfort being provided, I simply petted the dog and agreed that it was a truly loving act and more help than my counseling could provide. I knew he was in good hands — or to be more accurate — paws.